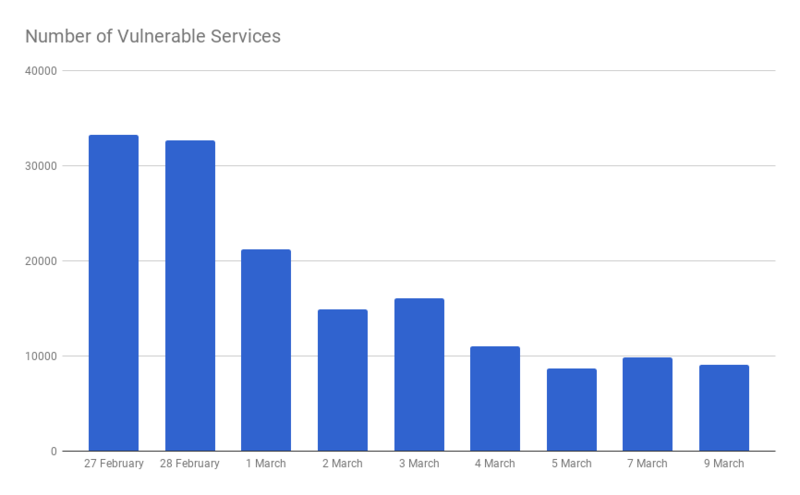 UPDATE: As of 2018-03-17 ( Morning Update), more attack using the memcached reflection vector have been unleashed on the Internet. As shared by Akamai Technologies “memcached-fueled 1.3 Tbps Attacks,” the application factors are “Internet Impacting.” Mitigation and Remediation Efforts are reducing the number of potential memcached reflectors. Please keep up the good work. Will your Efforts Help Safeguard the Internet? Yes! The proof is in the data. Qrator has been tracking the number of potential memcached reflectors. As see from their data, the list of potential reflectors has been going down. Your efforts to protect your network, your customers and the Internet will work with low-cost techniques which are already built into your network equipment. All Operators and Enterprise Networks – memcached on port 11211 UDP & TCP being exploited. This is now new. We know how reflection attacks work (send a spoofed packet to a device and have it reflected back. This vector has an extremely high amplification rate (ranges vary per test, but all of them are huge). One operator reported one reflection inbound produced +500 Mbps stream outbound. Operators are asked to review their networks and consider updating their Exploitable Port Filters (Infrastructure ACLs) to track or block UDP/TCP port 11211 for all ingress and egress traffic. Deploy INGRESS (coming into the ASN) and EGRESS (going out of the ASN) UDP/TCP port filters on 11211. This might have an impact on ephemeral ports for other services. As noted in “Should we deploy Exploited Port Filtering on Ephemeral Ports?” operator deployment experience over the last decade shows minimal customer support complains about the port filtering. The filters must be IPv4 and IPv6. Consider Rate Limiting UDP port 11211 to minimize risk. As mentioned by NTT, there are cases where rate limiting on IPv4/IPv6 on UDP port 11211 would be a way to minimize perceived collateral risk with ephemeral ports. Clean up Internet exposed memcached services. These services can use iptables on UNIX to filter, be removed, or other mitigations applied. The new version of memcached on GITHUB has disabled UDP by default …. “As reported, UDP amplification attacks have started to use insecure internet-exposed memcached instances. “ Digital Ocean is one of the Operators who had a lot of memcached on their network. They have posted a “how to guide” for how they have been remediating the attack vector: How To Secure Memcached by Reducing Exposure. This is a good example of community collaboration. What are you doing to protect against memcached reflection exploits on your network? How are you protecting our network? Are you deploying Source Address Validate (SAV) and IETF BCP 38 on your network to ensure people cannot use your network for attacks? Asking Operators drive Internet citizenship to help each other on the Internet. Shadowserver.org’s Open Memcached Key-Value Store Scanning Project has a long-term scan for this service. NTT and Job Snijders (job@ntt.net) demonstrate how ISPs, Telcos, and other Operators can work together for the “common Internet.” In an NLNOG 2018-03-01 post [NLNOG] memcached UDP/11211 IOS XR ratelimit example, Job list out the Cisco IOX XR filters they used. We will be working on more examples. Consider all of these examples as starting points. They provide examples and context to adopt into your router’s configurations. This example is from Job Snijders from what NTT deployed. I recommend adding memcached UDP/11211 to the same "exploitable ports"
Please share your own examples too!
. The following is from Jared Mauch from Akamai that would get people on Juniper routers started. “Kill Switches” are considered “Active Countermeasures. Active Countermeasures is where one connects back to a device they do not own and make any changes. Organizations cannot assume that Active Countermeasures are legal. Every organization considering active countermeasures, “attacking back,” or using tools which “flush a cache,” need to consult with their legal team. At this time, the memcached DOS reflection mitigated and remediated is working. The use of packet filters, rate-limiting, patches, and removal (see above). Corero has hinted at memcached ‘killswitch’ function. The industry response team’s investigation considered approaches that would clear violated memcached systems primed for DOS reflection. The technique would reply to known exposed and primed Memcache systems with a “delete <key>.” The method is viable, but not part of the first wave of industry recommendations. The approach contained many unknown back-end risk variables. As mentioned, the industry ‘active countermeasures’ approaches to DOS attacks malware infections, and other security threats are an “evolving” and considered legal grey areas. Organizations are consoled seek appropriate legal counsel before considering active countermeasures. More information about this attack vector can be found at the following (below). It is strongly encouraged to read through the articles and security advisories. These would help provide context unique to your network and additional details to deploy defenses on your network. The following are details on how to remediate/mitigate this issue. Blogs tell the story before, during, and after the incident. They share an example of how others experiences and managed the incident. Akamai: MEMCACHED, NOW WITH EXTORTION!